White paper on crime 2004 Part1/Chapter2/Section2/4. Fig. 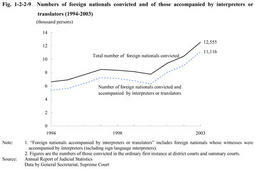 1-2-2-9 shows the number of foreign nationals convicted in the ordinary first instance and number of such foreign nationals who were accompanied by interpreters or translators in courts.Convicted foreign nationals,though declined slightly from1998to2000,have been in an overall upward trend.In2003,12,555foreign nationals were convicted and11,116were accompanied by interpreters or translators,both marking record highs.The proportion of foreign nationals to total convicted persons was13.8%(Source:Annual Report of Judicial Statistics,Data by General Secretariat,Supreme Court). In2003,11,179foreign defendants(foreign nationals accompanied by interpreters/translators;hereinafter the same)were finally disposed in the ordinary first instance,and a total of36languages were interpreted or translated.Chinese was used most frequently for4,585persons(41.0%),followed by Korean for1,420persons(12.7%),Tagalog for847persons(7.6%),Thai for621persons(5.6%),Spanish for573persons(5.1%),Portuguese for481persons(4.3%),and Persian for398persons(3.6%).The top three languages has been the same since1998(Source:Data by General Secretariat,Supreme Court). 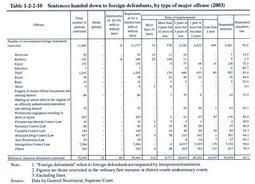 Table 1-2-2-10 shows the sentences(excluding fines)handed down to foreign defendants in the ordinary first instance in2003,by type of major offense.The rate of suspended imprisonment with or without labor for foreign defendants was85.6%,much higher than Japanese defendants(60.1%)in2003,since Immigration Control Law violations accounted for more than60%of foreign defendant cases and the suspended execution rate for them was extremely high(96.6%).The suspended execution rate of foreign defendants for other than Immigration Control Law violations was63.6%. Fig. 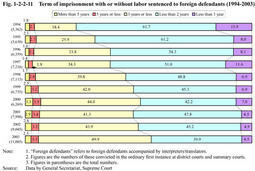 1-2-2-11 shows term of imprisonment with or without labor sentenced to foreign defendants in the ordinary first instance over the last10years.During the decade,the share of those sentenced to imprisonment for less than one year has declined,whereas the share of two years or more but not more than three years has risen.